Figure Skating is a winter event appearing in Mario & Sonic at the Olympic Winter Games and Mario & Sonic at the Sochi 2014 Olympic Winter Games. It relies on skills and speed. In the Wii version there are six pieces of classical music to skate to: Swan Lake (Tchaikovsky), Skater's waltz (Waldteufel), Fantaisie Impromptu (Chopin), Ave Maria (Schubert), Spring "Four Seasons" (Vivaldi) and the Nutcracker's Waltz of the Flowers (Tchaikovsky). In Figure Skating, only the Wii Remote is used. The character that is picked will skate laps around the rink, and the player must shake the Wii Remote according to the arrows. For example, if there is a down arrow, the Wii remote should be shook in a slapping motion. 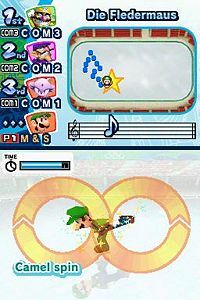 The Nintendo DS version of Figure Skating is a bit different from the Wii one. The player holds the stylus and drags the character where they wants it to go and then uses the stylus to perform spins and other tricks. There are three songs on the Nintendo DS version including Carmen (Bizet), Die Fledermaus (Strauss II), and The Nutcracker's March and Trepak played back to back with each other. This event reappears in Mario & Sonic at the Sochi 2014 Olympic Winter Games. The event is split into two events: Singles and Pairs. There are both five songs to choose from. In the Singles, there are three classical pieces: Meditation Thais (Massenet), On the Hunt (Strauss II), and Ride of the Valkyries (Wagner). There are also two songs, Main Theme: Super Mario World (Remix) from the Mario franchise and the Windy Hill - Zone 1: Sonic Lost World (Remix) from the Sonic series. In the Pairs, there are two classics: The Sleeping Beauty Waltz (Tchaikovsky) and Csárdás (Monti); a folk song: Dark Eyes; and video games: Main Theme: Super Mario Land (Remix) from Mario and The World Adventure: Sonic Unleashed (Remix) from Sonic. The Pairs, however, is played with a male and a female character, and the spin is now called the Death Spiral, which involves the female moving in a circle while the male is crouching and holding the female's hands. This page was last edited on March 9, 2019, at 09:59.